Power. Innovation. Disruption. Technology. Entrepreneurial. And Fun. 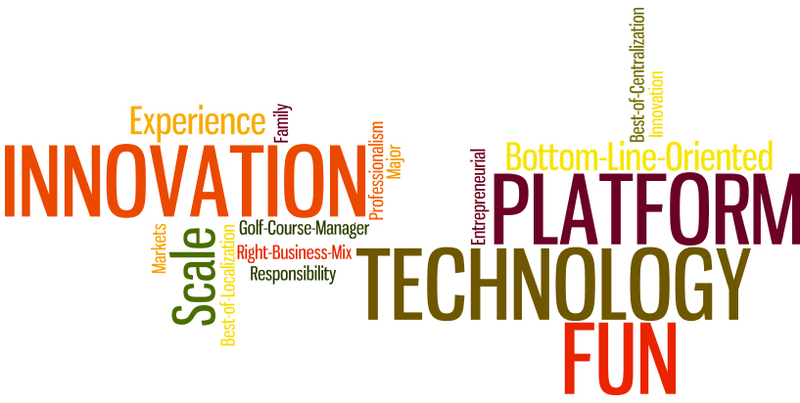 The word cloud below was built after nearly six months of interviews with both internal and external stakeholders including employees, industry leaders, clients, alumni and recent hires. The themes are clear. These are the key attributes of the modern Billy Casper Golf brand. As I discussed previously, our business has adapted over the years. For operator clients, Billy Casper Golf (BCG) represents a platform that they can leverage to grow their businesses. For employees, that same platform is used to catapult their careers while providing fun and enjoyable experiences for customers. And for the golf industry, BCG is respected as both a disruptor and innovator in solving big challenges that face the modern game of golf. We’ve experienced immense growth. Yet, our logo remained unchanged…until now. Today, we are proud to formally unveil the new logo. But first, let’s walk you through some of our explorations that led us to our final modernized mark. For all of our nearly 25 years in business, the buffalo has been associated with BCG and the firm’s namesake, Billy Casper. (The backstory can be found here.) There is a lot of brand equity in that association. The buffalo icon has even spawned new divisions of BCG such as Buffalo Brand Invigoration Group (formerly Buffalo Communications) and Buffalo Turf and Landscape Company. 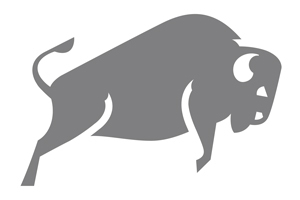 We felt it important to keep the buffalo image, but the “buffalo nickel” needed an update. Obviously Red Bull and Merrill Lynch logos are not images of buffaloes but we liked how the logos depicted power and energy. Inspired by these concepts, we pursued the direction of a modern, non-literal, charging buffalo. Success! The mark captures the key attributes of our brand including power, innovation, energy and a touch of fun. For most of us, we thought we were done. However, when we tested the logos in different uses such as print, embroidery (we produce 10,000 staff shirts a year) and digital, we found that in certain cases, the logo weakened. To put it another way, the logo’s utility was limited. Back to the drawing board (literally speaking). Replogle insisted that we hold on to the large format version of the buffalo above. Given the right texture and prominence, the logo delivers on all of the necessary attributes. At the same time, he and his team began exploring a secondary mark specifically scaled to accommodate smaller formats and provide versatility in situations where the larger buffalo came up short. We ultimately decided that we needed two marks instead of one to meet the needs of our BCG brand. “fluid identities” — logo systems that use multiple iterations of a mark (or series of marks) to communicate a particular aspect of a brand. These might take the form of [are] a logo that changes with each viewing, or a singular mark that gets impregnated with different imagery, depending on the context. At one point, these types of projects were few and far between, but now these isolated examples have grown into a full-blown trend. The days of the static logo are certainly not extinct, but this persistent way of thinking about malleable identities seems like a portend of things to come." Until recently, Twitter used both the blue bird and floating "t" logo. AOL has multiple logo versions in market. Consulting firm PriceWaterhouseCoopers also uses multiple marks. Virgin uses alternate forms of its hero brand for many of its sub-brands. These are just a few examples. And, as of today, BCG joins that trend. All creative projects are subjective and this one is no different. When you change something as personal as a logo and one that has been in place for a long time, opinions are strong. We had a fair amount of debate about things like the tail on the buffalo, color schemes and getting the right blend of modern and traditional. In the end, I couldn’t be happier about where we landed. Hopefully this post will provide some insights into the process behind the project. Time will ultimately provide us a grade on the final deliverables but I like our chances. Big shout outs to Sparky's Garage, Marnie Boyer, Frank Denniston, Alex Elmore and Peter Hill on this project. Further props to BCG designers Kevin Chiang and Anca Popa and of course, Jessica Lewis who continues to amaze as the master of all things digital. An assist also goes to Jill Timon and Emily Clark from our marketing team and Tom Reilly from HR. Your input was critical to the project. The collaboration was a blast. I am extremely lucky to work with these people and the rest of the BCG team as we continue to build the most powerful operating platform in golf. If you have any questions about this project or any of the information in these posts, reach out to me via email or on Twitter at @kyleragsdale. Talk soon. Until then, get out and play some golf and as always, stay BUFFALO STRONG.